The next day I woke up tired from a week of hustling between San Pedro de Macorís and Boca Chica. I told myself I’d just take a few photos in San Pedro and relax the rest of the day. I did just that, only I happened to see a man reading a newspaper at a convenience shop. I asked him if I could see it for a second, and I skimmed through the sports section, which was most of the newspaper. The front page said that Alex Rodriguez, known as “A-Rod,” was arriving today. I have to go to Colorado’s academy, I thought, as I hustled to the bus terminal. An hour later I was at the academy. So was A-Rod. The team was in the same spot, performing easy warm-up and agility drills. There were just a handful of photographers the day before. Now there were at least two dozen journalists pacing around the fences, trying to get a good angle for a photo or video. Apparently a lot of fans had seen the same headline as me and knew how to get here. They filled the bleachers behind home plate during batting practice and followed A-Rod wherever he went like a flock of sheep. He seemed to ignore the fans yelling his name. Though he did turn and smile when a fan told him he needed some money. Unlike the other players, A-Rod had a special group of bodyguards with walky-talkies. Yesterday it felt like a bunch of ball players. Today it felt like celebrity news. In fact, a news conference was held after practice underneath a tent. Most of the questions were addressed to A-Rod or Pujols. The entire press conference was in Spanish. 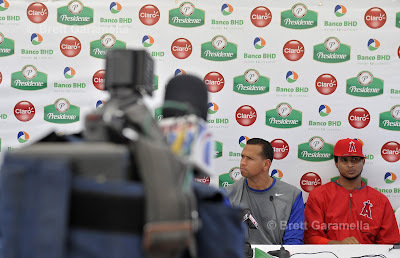 A-Rod explained that it was his mother’s dream for him to play for the Dominican Republic. He said he had been blessed with the option of playing for both the United States and the D.R. (In the 2006 World Baseball Classic, A-Rod played for a United States team that didn’t make it past the second round. A-Rod has dual citizenship because he was born in the U.S. and his parents are Dominican.) The players left in large SUVs with tinted windows. 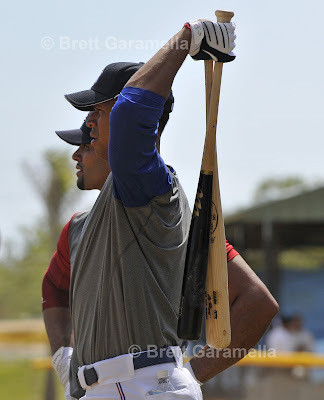 Although I got some good shots, I felt more relaxed at the Cubs Academy, where the players were watching a movie and attending English class in flip-flops and shorts.